Am I the only person who thinks this guy isn’t wearing any pants? I have passed by this particular display countless times! Since I don’t drink wine and I think those particular type of crackers are fairly nasty, I never really paid much attention. But please, Kroger! There are CHILDREN at this grocery store! That is just wrong on so many levels. After be ocularly accosted in the rear of the store (pun intended), I figured I had everything I wanted and some things I didn’t. I composed myself and went to the check out line, paid for my groceries and headed out to the parking lot. As I was pulling out of the parking lot, my phone rings. It is my husband calling. “Are you still at the grocery store?” This means one of two things: 1) “How much longer are you going to be?” or 2) “I forgot to ask you to get me some jelly beans.” On this day, it was the latter. 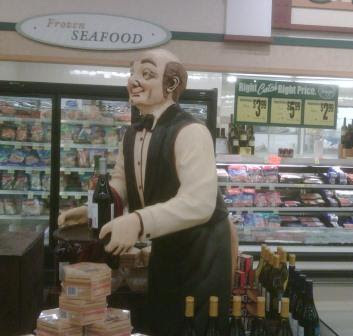 I really didn’t feel like going back to the store, as I was still visibly shaken by the pornographic cheese buttler. 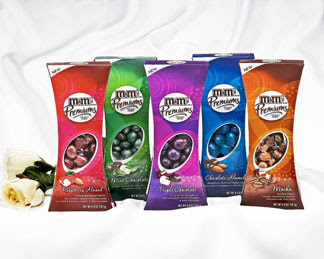 But since Katdish = obedient wife, I turned the car around and went back to get 3 bags of Jolly Rancher jelly beans. (They are the best.) Obviously, I didn’t get a cart or a basket. I can manage 3 bags of jelly beans all by myself, thank you very much. So guess what? They’re on sale. They are ordinarily $2.99 per bag, but the sale price was 3 for $5.00. I call dh to ask him how many bags I was supposed to buy. Yep — six. “Oh, and by the way, we also need Cheetos, saltine crackers and tortilla chips.” Great! As if I don’t already look like a big enough tool walking around with 6 large bags of jelly beans. Might as well go for broke. No, I do not heart grocery shopping — not even a little bit. 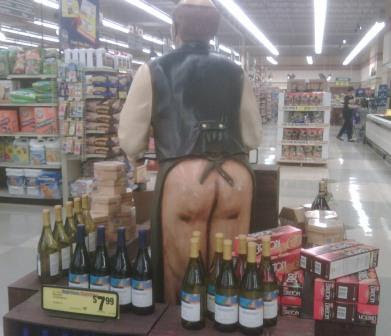 But the candy aisle was somewhat educational. 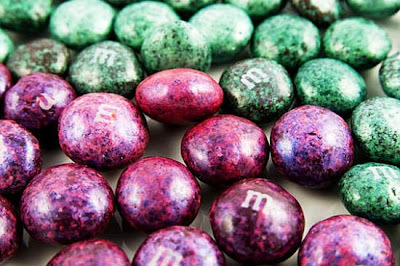 Have you heard about the new m&m special dark chocolate candies? Yeah. Still not so sure about that. But to end on a positive note, guess what they were selling in the bakery? (Cue the angelic, cherub choir.) Chocolate chip pumpkin muffin tops! Yum-O! Now, that there is a muffin top I can give truly get behind.